Elena Nayal has worked for MacKenzie Security for years. Quiet and unassuming, she stays in the shadows of the world’s most elite clandestine agency. But she’s trained relentlessly after hours, and her only thought is to be strong enough to track down and kill every last one of the men who brutally attacked her. Lieutenant Brady Scott is no stranger to special ops. He commands the greatest SEAL team in the history of America. But fighting for the woman he loves turns out to be the most difficult mission he’s ever been on. He must decide whether to let her walk into a suicide mission on her own, or ignore every rule he’s sworn to follow. This collection is always a fan fave and I loved reading your novel! What do you love most about this project? This project is one of the most fun things I’ve ever done. I love that some of my very favorite authors are writing in my world. How cool is that? I’m such a fan of everyone who has contributed a MacKenzie novella, and they’ve all done such an amazing job of not only telling a great story, but of meshing their world with the MacKenzies. It’s so much fun to do! Brady Scott and Elena Nayal have been on the scene for a while now, and they’re finally getting their happily ever after. Brady first appeared several years ago in CADE as the brother of my heroine. And Elena first appeared in SHADOWS AND SILK. As the series progressed, even though I didn’t originally plan for these two to end up together, the idea took root and I knew they were meant for each other. Does this mean I’m supposed to make up a color, or just say a color that already exists? I have deadline brain, so I can’t do hard questions. But if I were to pick a color that already exists to put into a crayon box, I’d pick red. I love red—red cars, red purses, red highlights, red lipstick, and red soled shoes. I don’t watch TV unless I’m in a hotel, which I happen to be right now, and I just saw my very first episode of Modern Family last night. I know, I’m years behind. But if I ever get some time off I’m going to binge watch all the seasons. I’m at the end of an insane writing schedule, and I’m finally seeing some light at the end of the tunnel. 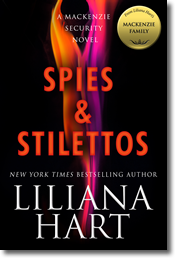 After SPIES AND STILETTOS comes out March 21, I’ve got three new books in my brand new Gravediggers Series coming out in May, June, and July. I’m currently writing the third book in that series, SAY NO MORE. Then I’m going to take a crazy vacation and binge watch a lot of TV.